Dollhouse Magazine or The Minis Zine as we call it. This is your official Invitation to join our Dollhouse Magazine Community. The Minis Zine. We would love to have you. It is not a difficult procedure to join. All you have to do is fill out the form at the end of this page. Then look forward to your monthly issues. We usually send out our Zine at the end of each month. So look for it in your email between the 24th and 31st. This is the time that has been the most effective for us to send our publication out. A notification is sent to your email and our Ezine is published online. So your email is not overloaded. What we advise doing is simply saving the Zine's Back Issues Page so you can always know where all our issues are. Worth noting is the fact that your personal details will absolutely not be used for anything other than subscribing to our Dollhouse Magazine Community either. 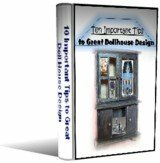 A Main Dollhouse Topic - These articles deal with anything related to dollhouses or miniatures or anything in between. Topics of popular, creative or structural demand. Miniature Project or Technique - In this section we cover a new project with details as to how you can create something for your mini environment. We usually stress using your own creative zeal to get the most out of each project. Anything you design, or are encouraged to, always outweighs something copied. Which adds to your overall self esteem. In the Spotlight - This is where we highlight a special item regarding your tiny dwellings. Any items that come to our attention that we would like to share with you will be listed here. So check it out you could find something to add to your small world. Who knows what you will discover next!!! Our Share Categories - These are relatively new. We encourage you to pick a topic and share something of interest to you. Be brave and submit. We love hearing what's on your mind any time. Try to stay within the topic but don't be shy we are not awfully concerned about things that are a bit off. However don't go way off topic and you should be fine. Believe us we will find a place for you as you submit. Our Final Category Deals with Subscription Details. Like how to subscribe or unsubscribe from our dollhouse magazine. Yes we are holding no one prisoner. You can subscribe or unsubscribe easily with no questions asked. Interesting products we find online and think you would like to know about are also emailed out on occasion. However never bothersome or inconveniently. So rest assured you have no worries. 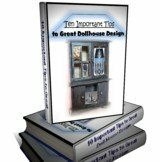 As a final treat for subscribing you will also be receiving a copy of our Complementary EBook titled -- Ten Important Tips to Great Dollhouse Design. What design elements have you forgot? Simply fill in the form below. To begin your subscription. You may also be eligible for our Newest Offer. Read more about that here.